Corinne knew from a very young age that she was destined to be an attorney. The daughter of Judge Kim R. Hoover and the granddaughter of the late Attorney Orval R. Hoover, Corinne grew up in a family that excelled in the legal field and taught her the value of helping others through difficult legal issues. Now, Corinne has carried on that family tradition, along with her brother, Attorney Tad Orval Hoover, practicing in the same building that her father, grandfather and other extended family practiced before her. As the mother of three young children, Corinne knows nothing is more important than family. Because of this, Corinne'spractice area focuses exclusively on family law, including divorce and dissolution, child custody, paternity, child support, adoption and other issues that effect families, including estate planning. Corinne has extensive past experience as a Guardian ad Litem (GAL) in both domestic relations and juvenile court and has also taught seminars and training classes for other GALs. She formerly served on the Board of Directors for Ohio CASA. 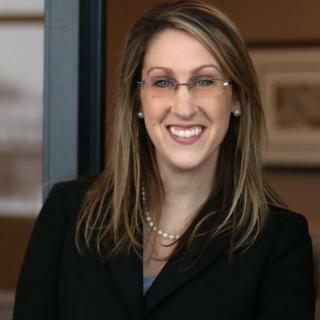 In addition t her litigation-centered practice, Corinne is also a certified divorce and family law mediator. Previously, Corinne served as a magistrate for the Norton Mayor's Court and as Special Counsel to the Ohio Attorney General, where she was charged with collecting debts and protecting the financial interests of the state in courtrooms all across Ohio. Corinne also served as an Assistant Prosecutor to the City of Tallmadge and as a law clerk for Judge LindaTucci Teodosio in the Summit County Juvenile Court and at the Summit County Prosecutor's office. Corinne resides in Silver Lake with her family.